So here I am on a Friday night at 11:30pm writing this article for my team to digest. The title sums up the blog nicely. 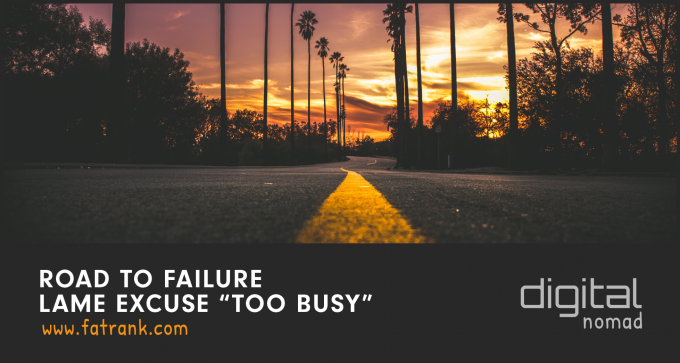 Road to Failure – Lame Excuse “Too Busy” is more driven towards motivational speeches and how the easy default setting of TOO BUSY should never be used in your vocabulary. Entrepreneurs are never too busy because they employ staff to carry out the brunt of the work so they can have time to think, grow, improve SOPs, develop and scale. 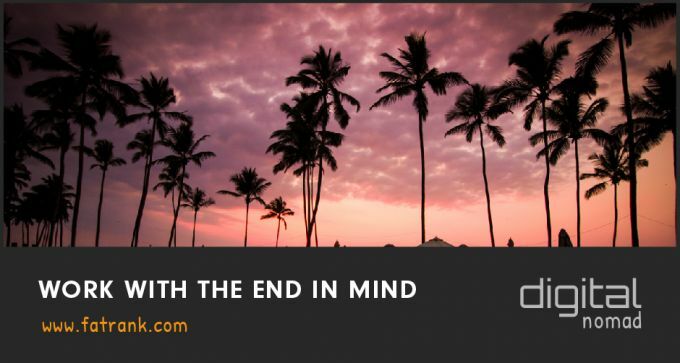 I was interested in whether any entrepreneurs have ever come across this in business. It’s important not to point the finger and start branding people as ‘lazy’ or ‘not willing to work’. In many situations, this sort of attitude can be a result of poor leadership or unclear instructions. If someone is unsure of what their role is, or they don’t feel like they fully understand what they need to do, they are likely to withdraw and develop negative feelings towards their job. By spotting these issues and clearing up any misunderstandings, you are much more likely to engage the employee and make their working environment more positive and enjoyable. The best way to start countering these excuses of ‘no time’ or ‘too busy’ is simply asking questions. If you ask the right questions, you’ll most often prove—without explicitly saying it—that many excuses aren’t 100% justifiable (i.e., if your employee had started the project when you first assigned it, he would have had plenty of time). But more than that, asking these questions will convey to your employees that you’re not just going to sit back and accept excuses without a word. If someone is struggling to keep up with their workload or complete their tasks, there’s often a reason behind this. Of course there are just some people who want to get away with doing the minimum amount. However in many cases there will be something you can do to help. Maybe they are finding it difficult to prioritise different projects, or they don’t enjoy certain aspects of their role. Obviously it’s going to be rare for someone to enjoy every single part of their job. But perhaps it would be better for another member of your team to take on these tasks? Rethinking who you delegate projects to might create a solution which works best for everyone. Consult your team and find out whose strengths lie where so you can set tasks accordingly. You may find that someone enjoys doing a particular task more than someone else, meaning they’ll probably do it more quickly and efficiently. By speaking with your employees and finding out what they actually like doing, you’ll have a better chance of making things more productive. Everyone needs motivation in a working environment. You might feel that you are spending extra time trying to motivate certain people who are falling behind. However, the truth is that everyone should feel motivated and happy in the job role. We all have our bad days, our hangovers, our sleepless nights, stress with money and arguments with loved ones. But it is the self discipline to motivate yourself that makes you graft. Many get the violin out and want help, assistance, love, care and the real winners in life graft and motivate themselves to work hard. If you want to improve your team’s efficiency, productivity and output without spending an absolute fortune on over-exaggerated showmanship, then all you really need to do is think like a leader! Keep your people happy and engaged. Build trust within the team. Never ignore a problem in the ranks. You’ll notice that the strategies we’ve outlined above are just really easy, really small changes in attitude and behaviour. But they’ll make a huge difference and you’ll soon notice the increase in engagement and a brightening of mood. Communication is The Key – If you think you’ve got a capable staff member but they’re under performing, there’s really no point beating around the bush – face the problem head on. Call a formal meeting, sit down with said staff member and constructively discuss what’s going on, constantly reminding the employee of the important role they play to the business. In most cases, there’ll be a reason why they are under performing; it could be because of personal issues, unreachable targets or perhaps, they’re struggling with some part of their job. You’ll never know unless you ask. This conversation will give you an opportunity to help those who are genuinely struggling. However it should also give those inherently lazy employees the kick up the backside they need to get back on track. Set Objectives – Could your employee simply be lacking direction? Some people work better when they have strict targets – not everybody can or wants to work under their own initiative. This is often the case in collaborative environments where people have many different projects to complete and many different teams to confer with. Without some kind of guidance and structure, it can leave employees with piles and piles of projects, to finish, without knowing which one is the top priority. Here is a great training web page on setting objectives structure – http://www.smartsheet.com/blog/essential-guide-writing-smart-goals Agreeing on targets and prioritising workloads with your employees will really give them a much more clear structure of what they need to be doing. If someone understands their role and the tasks you set them, they are much more likely to succeed and enjoy their work. SMART managers create Specific, Measurable, Achievable, Relevant, Time-based goals. Offer Progression – One of the best incentives you can offer your employees is a clear route for progression. Would you want to be stuck in a role with no prospects of promotion, new responsibilities or change? Most people wouldn’t – and that’s when unhappiness and indifference start to creep in. Why exactly should I go the extra mile? I’m not going anywhere anyway. Working towards a possible promotion can have a massive morale boosting effect on your workforce. It may just snap some out of their lazy slump! Address Any Training Issues – Of course, if you’re going to offer progression, you must have the right training in place to back it up. There’s nothing more frustrating for an employee than being unable to do part of their job and asking for help all of the time. Their morale will fall, they’ll feel like a burden or they’ll start to get complacent (AKA lazy). If you develop employees through training, you are likely to see the rewards. You’ll have a team who will show more commitment and be more capable of delivering success to the business. Give Them More Responsibility – Is your staff member lazy or just bored? Going back to point one – it’s time to have a chat. In most cases, your employee will admit that the reason they’re feeling demotivated (and a little bit lazy). It’s often because they find the job too easy, don’t feel valued enough and are being underutilised. Handing over more responsibility will make them feel more valued. It also gives added motivation to do well – it’s their neck and reputation on the line, after all. Determine Their Interests – Do you enjoy every single aspect of your job? Most people don’t. Are you good at everything? Most people aren’t. An important part of being a good leader is being able to identify your employees’ strengths, weaknesses, likes and dislikes. You can then give tasks out in the most productive way for your team. If you can, assign tasks based around personal strengths (for example, organisation, leadership, team-work). This really can boost productivity, morale and overall output in your office. If someone is apathetic towards a certain part of their role, they’re much more likely to do a bad job of it. So that’s where your ‘lazy employees’ start to appear. Assess Your Entire Team – Although you may recognise that one individual is showing signs of laziness, the problem may not be isolated to just them. Sometimes, it can be a symptom of a much bigger problem, affecting the entire team. Carry out an internal audit. Have an open (no-judgement) meeting and get feedback from the staff. Be straight with your employees – just ask them, what’s going on? If you’ve noticed a decrease in engagement, output and general happiness in the office, then you need to find out what’s causing it. Offer Support – Our personal lives have a real effect on our work. So when you first notice a ‘lazy’ employee, it’s really important to try and work out whether anything is going on in the background. Make sure you’re approachable and friendly and when you know there has been an issue, be as accommodating as possible. I promise the loyalty and respect you gain from treating staff fairly (and like human beings) will be worth it. Know When It’s Time to Give Up – There’s only so much you can do to motivate your employees. Sometimes, you’ve just managed to hire a bad (lazy) egg. If the rest of your team are performing well and seem happy and engaged, but one employee is trailing behind (and they haven’t got any personal issues going on) it’s time to make a change. Otherwise they’ll bring down the morale of the whole team! No one likes working hard and looking across at a co-worker who gets away with bloody murder. While it’s true that some people can use the excuse of being too busy as a way to avoid taking on new tasks, it’s also important not to dismiss this completely. If you are saying yes to every opportunity that comes your way, and passing huge amounts of work onto your staff, you’re going to end up with a problem. Agreeing to take on new projects and then not being able to complete them is a waste of everybody’s time. Make sure to only give your staff work that they can realistically keep up with. Otherwise you will get stuck in a cycle where people are confused and don’t know what to prioritise. Learn when to welcome new opportunities which will grow your business, and when to say no to things that you can’t fully commit to. I got told to read an awesome book called ‘Who Moved My Cheese?’. This book is written about change happening. You need to adapt with the times i.e. move with the cheese. The main points I took from the book is that change happens. Deal with it. Prepare yourself for the change. Monitor your workload and always try to improve. Anticipation that you need to move with the times is key to success. Some people in life always stay within their comfort zone. But get ready for the change. Adapt to change quickly. The quicker you let go of the old cheese, the sooner you can enjoy new cheese. Enjoy and savour the adventure of the new cheese. Be ready again though to quickly change and enjoy more new cheese. Embrace the journey of new ventures and stay with the current times. How Do You Motivate Yourself for Work? Come on then readers let’s hear how you motivate yourself for work! I want to know what videos you watch, which people or mentors you follow for advice. Share more information with me that I can include in this article. I want more help and assistance to add another 1000 words onto here, several motivational videos you love and your personal opinion on this blog post. I want to network with you because synergising is so important in life. When new staff start at our offices, training them straight away to have the right attitude is key. We always want our staff to go the extra mile in the workplace. Having the attitude to go above and beyond will always help you progress. Comment on this article or tweet myself @james_dooley to voice your opinion because I love to hear all angles on this debate. Do you suffer from this excuse and need to break the mould? Comment below on ideas you are trying to do so that you can prevent this from happening. 8 How Do You Motivate Yourself for Work?